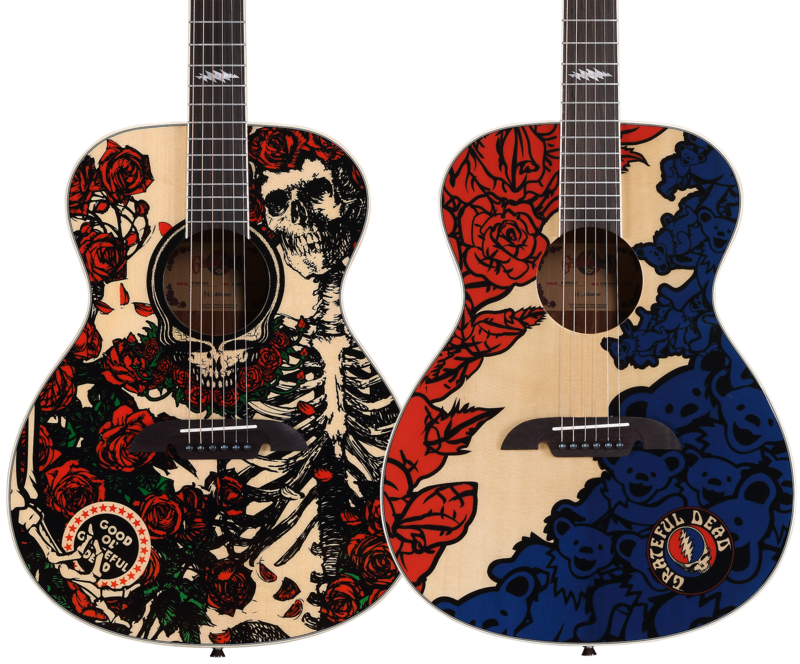 Continuing our celebration of the Grateful Dead's artwork, Alvarez is releasing a limited run of two designs featuring the band's iconic imagery. 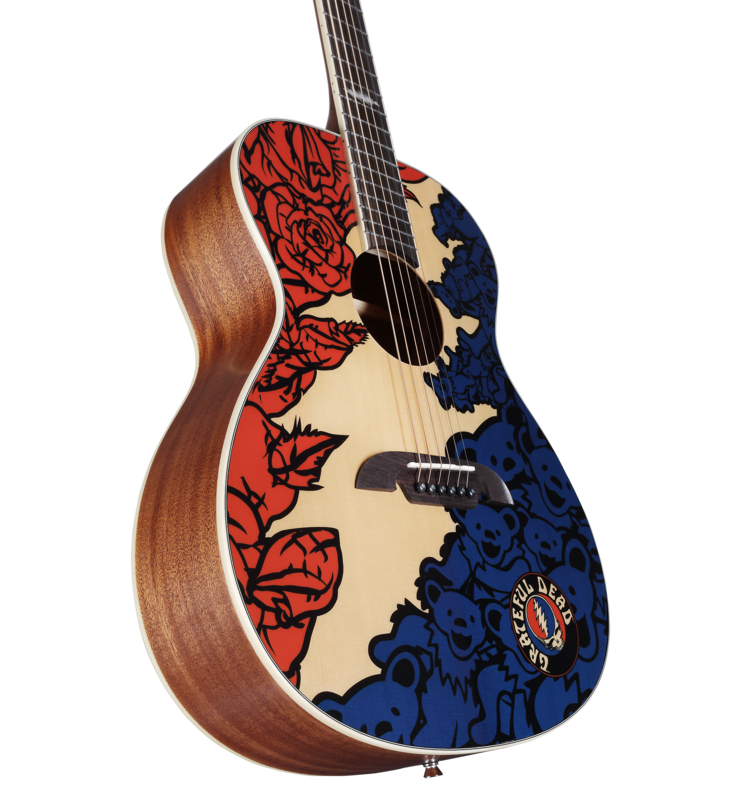 Alvarez is incredibly proud to have worked with the Grateful Dead for many years and making signature models for Jerry and Bob was a true honor. In the history of modern music, few bands have captured the hearts of so many people or created such a loyal following as the Dead. Along with their amazing music came a huge amount of stunning artwork created by the band, their friends and their fans. 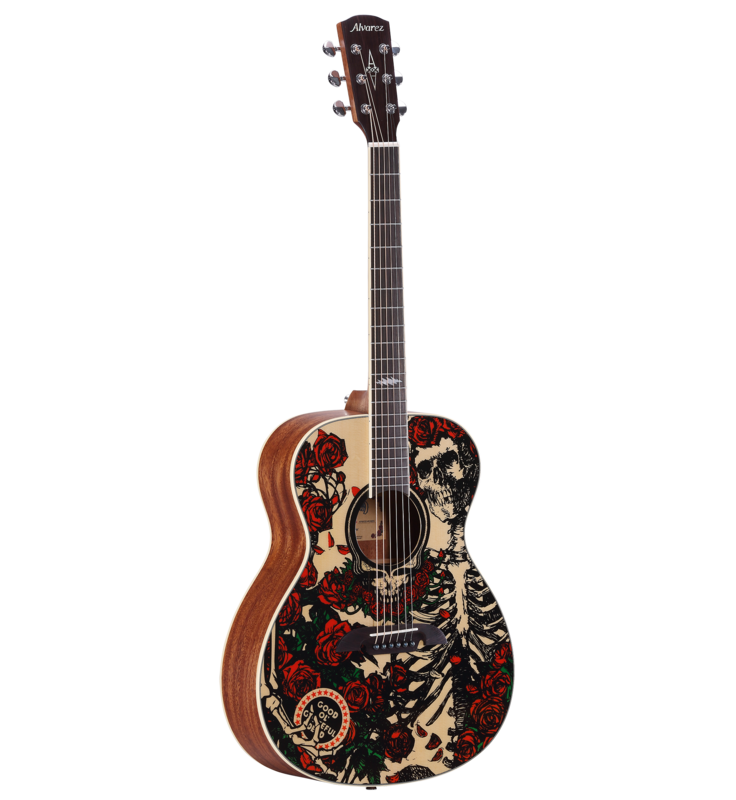 For Alvarez to be asked to use this artwork and apply it to our instruments is a dream come true. 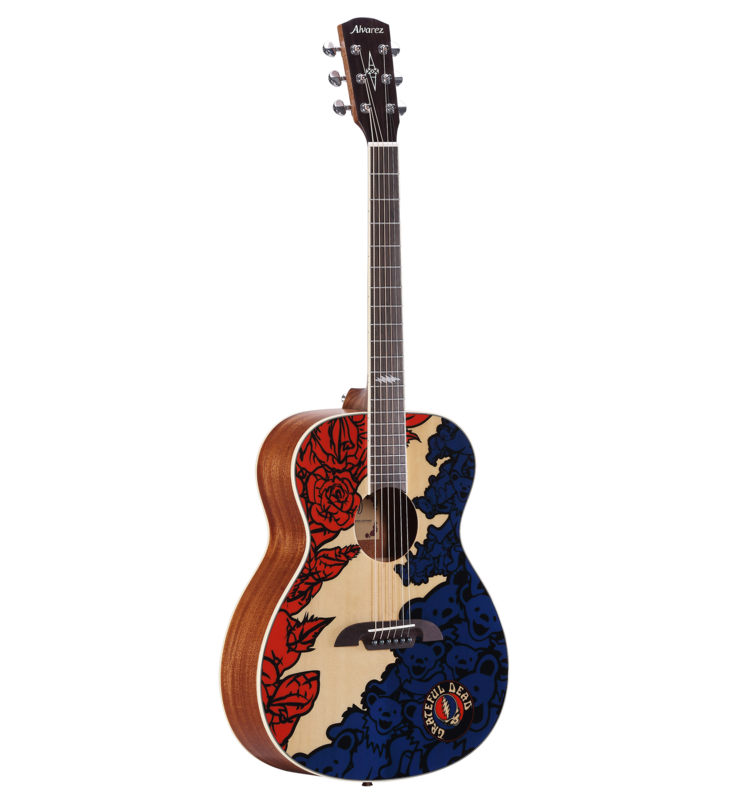 Following on from the success of the Grateful Dead 50th Anniversary guitars in 2015, we are proud to offer another two limited edition models with very classic artwork of Bertha with Roses and Steal Your Face with Roses and Dancing Bears. 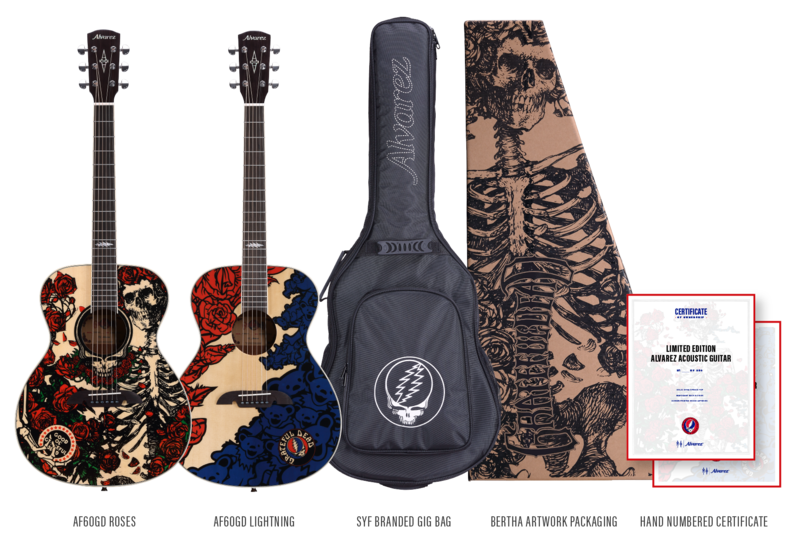 Only 400 of each model of the AF60GD-Roses and AF60GD-Lightning will be sold worldwide and each guitar ships in a deluxe licensed gig bag with Steel Your Face logo. There’s also a certificate of authenticity. Order yours today while stocks last. 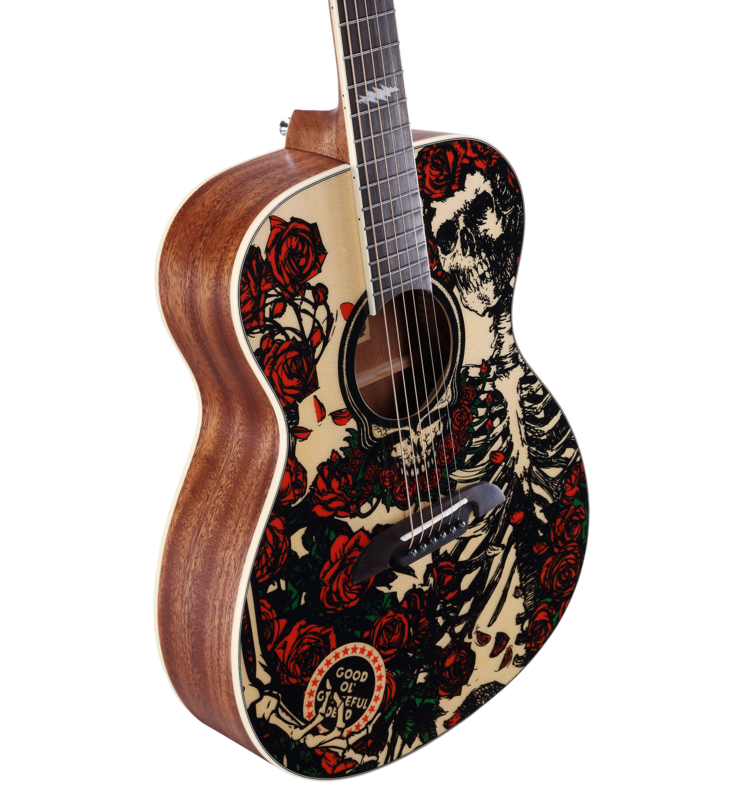 The graphic for AF60GD-Roses features a full rendering of the iconic Bertha skeleton and roses. 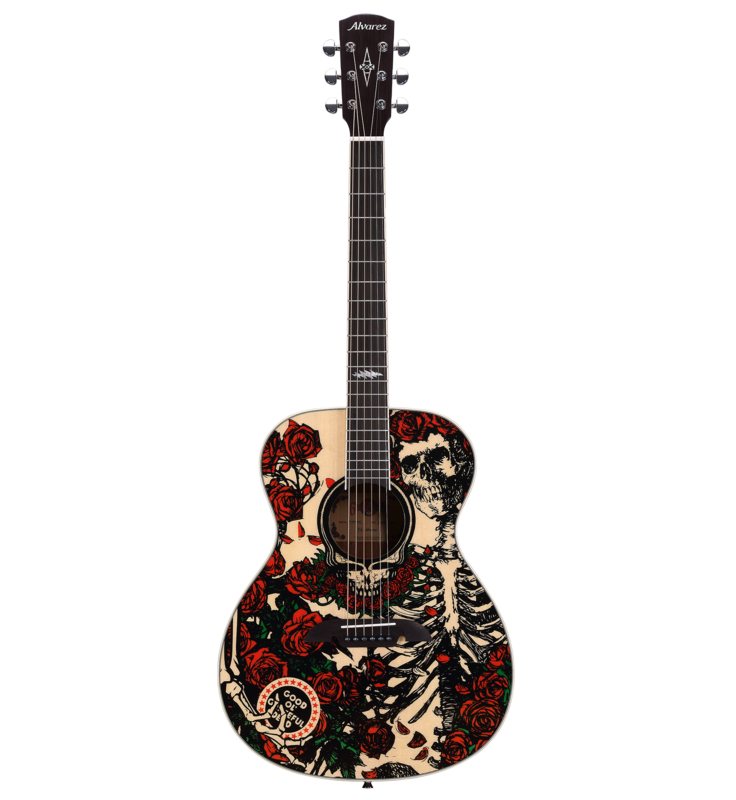 Also known as Skull & Roses. Bertha was originally composed by Alton Kelley and Stanley Mouse, who added color and lettering to a 1913 illustration by Edmund Joseph Sullivan. 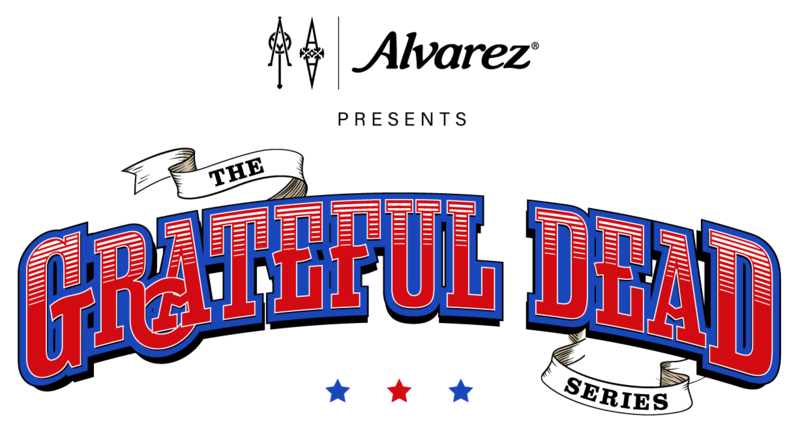 The artwork first appeared on posters for the Grateful Dead’s 1966 shows at the Avalon Ballroom in San Francisco, and quickly became one of the band’s most recognizable images. The guitar is an OM model, a shape renowned for its balance and tone and the AF60GD build quality is superb. 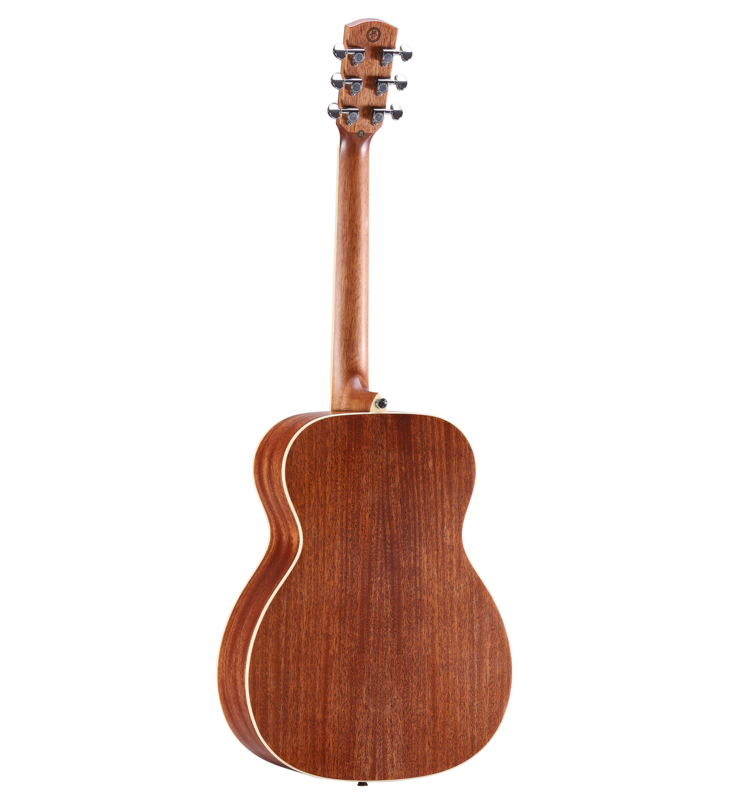 Made from a solid A+ Sitka spruce top and Mahogany back and sides with our FST2 forward shifting bracing system. 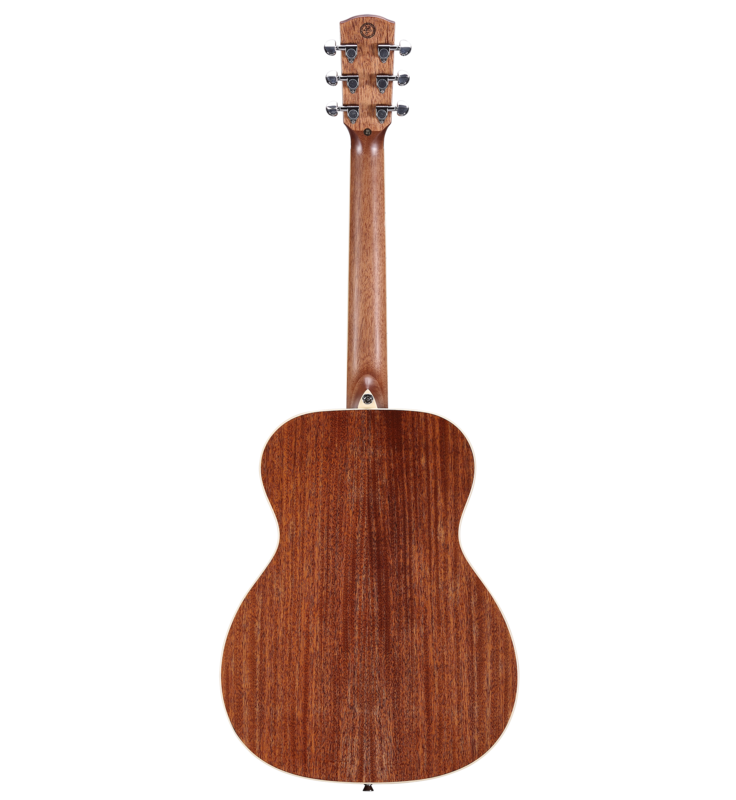 The guitar offers a lively response and great projection. 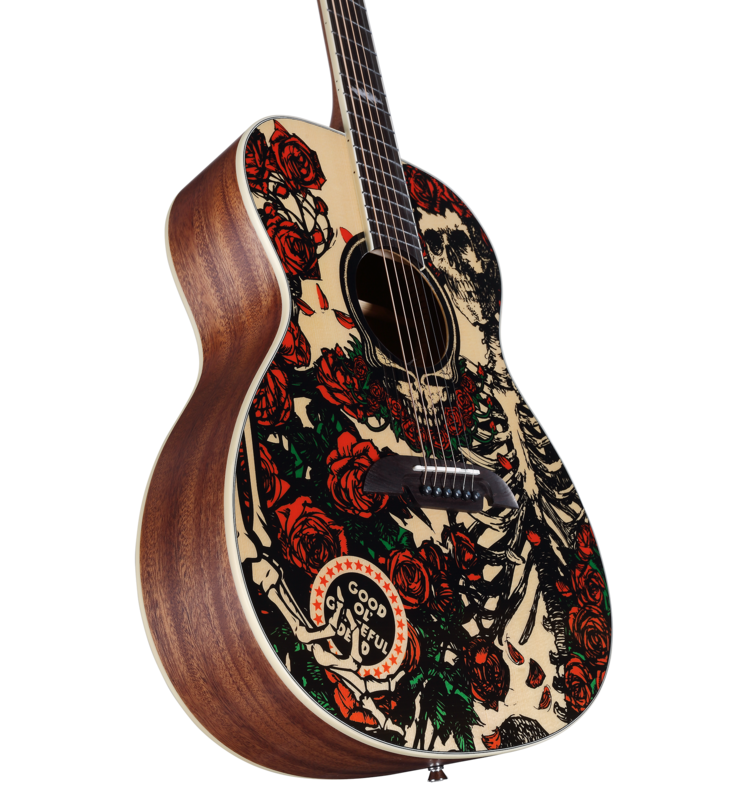 The iconic artwork has been cleverly silk-screened on to the spruce and then the guitar is finished with a flawless gloss topcoat. 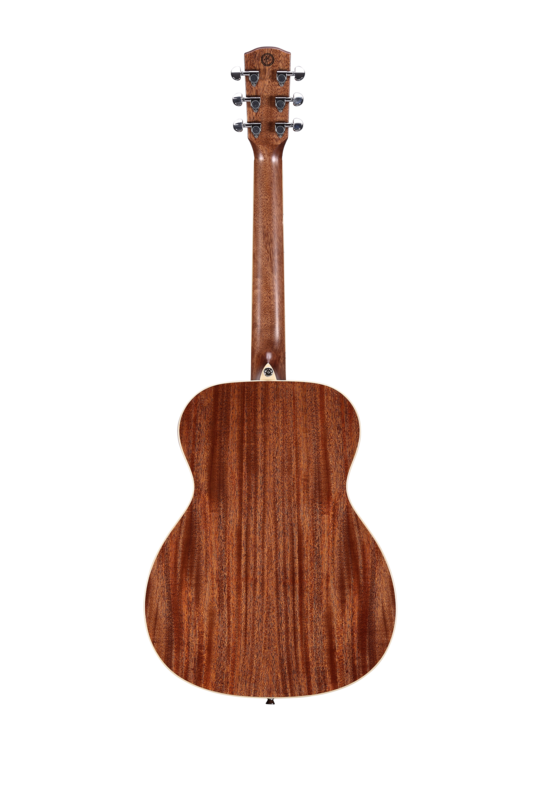 Other appointments include the Alvarez Bi-Level bridge, 12th fret lightning bolt inlay, real bone nut and saddle and a great quality gig bag and numbered certificate of authenticity. 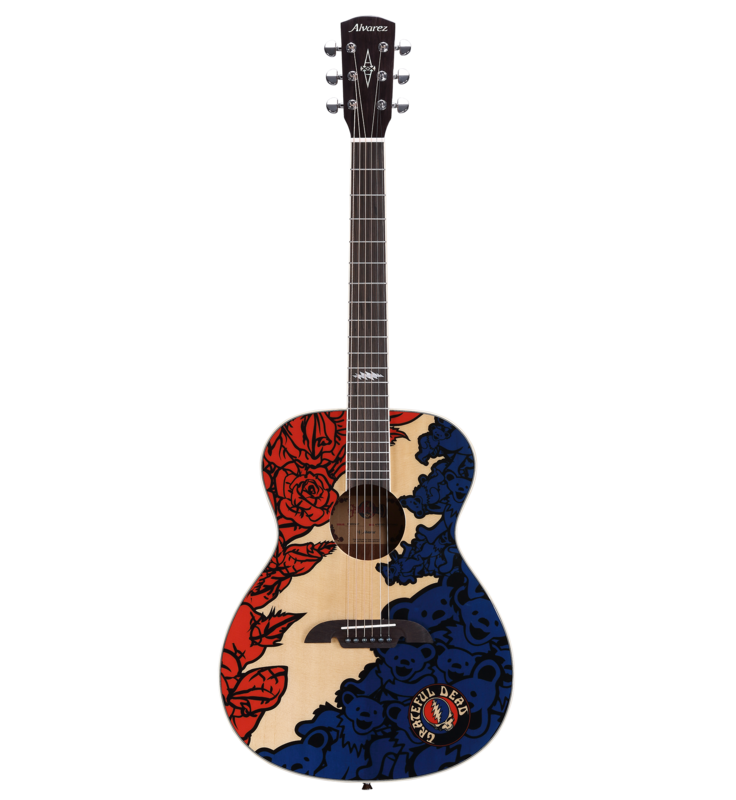 The AF60GD-Lightning features an emergent rendering of the iconic 13-point Lightning Bolt logo created by Owsley Stanley and first appearing within the Steal Your Face logo on the album History of the Grateful Dead, Volume One (Bear’s Choice). 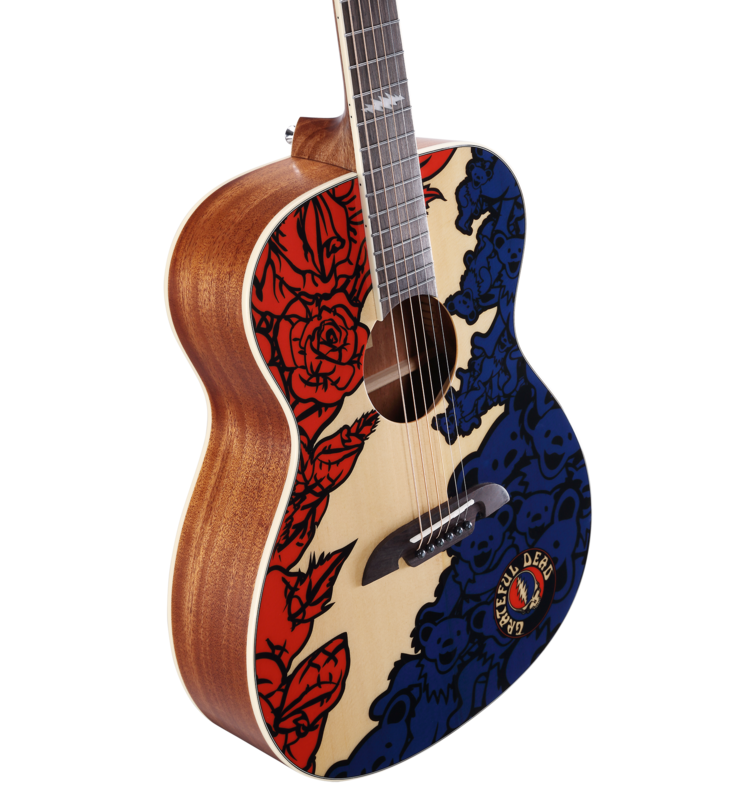 The Lightning bolt is revealed between a cluster of Dancing Bears on the right, and iconic red roses on the left. Stanley originally designed the lightning bolt as a symbol to identify the band’s equipment on the road, but the striking imagery evolved into the band’s album artwork and other logos.